Once upon a time I was a die-hard minimalist runner and refused to train in anything with a heel-toe drop of more than about 5mm. The Mizuno Wave Sayonara was the shoe that pushed me to being open to different shoes regardless of heel-toe drop. I liked it so much I picked up a pair after trying them on and did a very hard Fartlek workout in them on my first run. So much for breaking the shoes in. As you can probably tell, we have the Mizuno Wave Sayonara on deck for a review! 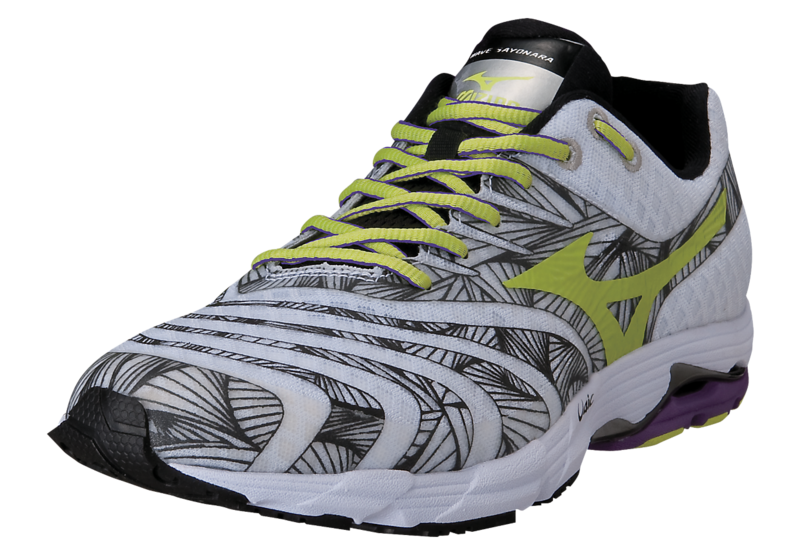 The Mizuno Wave Sayonara is a lightweight trainer that took the place of the Precision and the Elixir. It is listed at 8.1 ounces and supposedly has a 10mm drop. 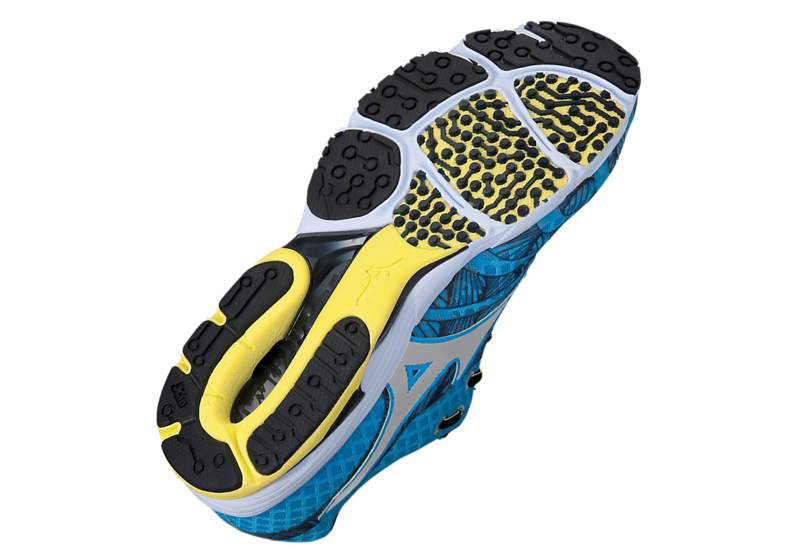 It was one of Mizuno's first shoes to debut their new U4ic midsole that is now in all or almost all of their shoes. Before I started training in this shoe I was wearing the Mizuno Wave Cursoris. You know. 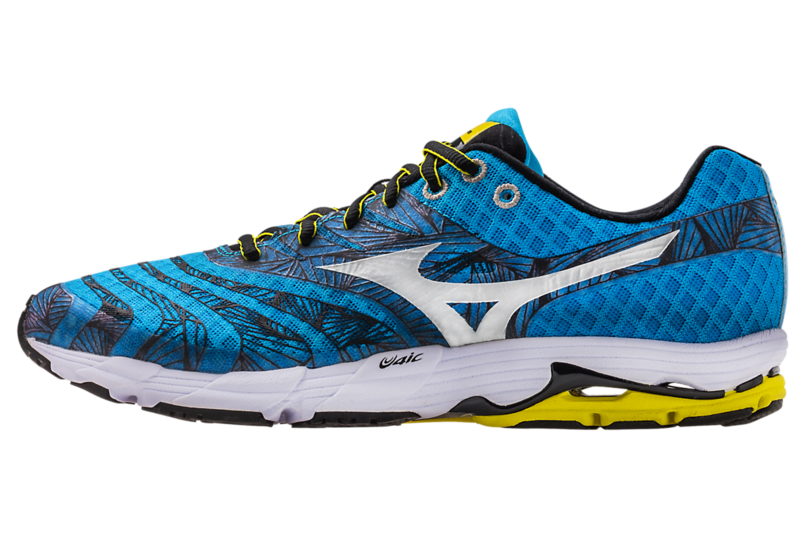 One of Mizuno's full on dives into the zero-drop market. Which is now being taken off the US market. However the Cursoris 2 and Levitas 2 are available now in Europe and Asia. So if you're over there, check them out and tell me how they are. Anyway, I was training in the Cursoris and was getting really tired of how the soles got torn off after about ~120 miles of use (that durability in the forefoot was horrible. As I've said before, I am hard on shoes). Right then Mizuno came out with the Sayonara and people were raving about it. I tried a pair on during a quite moment while working at Foot Traffic and I was very surprised. Surprised enough that I immediately bought them. First what blew me away was how well they fit. I'm very picky on the forefoot and toe box fit of shoes. Having them too narrow is a major turn-off for me. And that was one of many reasons I had been steering clear of traditional shoes, even with a nagging on and off peroneal injury that I kept running through (pressure was taken off that with higher drop shoes for me). These had a very good fit in the forefoot. I know the term "fits like a glove" is overused, but that's how they fit. The upper is a little stiff, but has the combination of holding your foot down well and having a spacious fit. The stiffness of the upper does break in a bit and form to your foot as you put more miles on the Sayonaras. Even after breaking in, the upper remains very durable and I have not seen any tearing or wear in the +200 miles I'm put on them. The midfoot and heel is on the narrow side in a way that will REALLY grip your foot. Not uncomfortably so for me, instead in a good kind of "Lockdown" way. I never had to worry about heel slippage in the Sayonaras, although I still did a lace lock because it's just a habit. For those of you with narrow feet, you'll like these shoes through the heel and midfoot, then if you like a wide forefoot, you'll like them even more. For those with wide feet, the midfoot and heel may be a bit snug. The forefoot will feel fine though. Again, that forefoot width is awesome. Speaking of fit, these shoes fit about a half size big, so take that into consideration and go try them on at your local running specialty store. That heel-toe drop obsession that I mentioned early? The amount in the Wave Sayonara feels like 8mm to me despite the measurements of it being about a 9-10mm drop. I felt it, but it didn't bother me. Why? Because these shoes are VERY responsive. These are not cushioned trainers at all. Do they protect your feet from the road? Yes. Would they work as a half/marathon racer? Definitely yes. I personally would opt for something lighter, but this would make an awesome long distance racing shoe. This shoe has a ton of pop and I have very much enjoyed using it for tempos and fartlek workouts. Should I have run my first half marathon in this shoe? Maybe. But I was Brooks crazed and only want to train in their gear because I was hoping to be sponsored by them. Personally I think this shoe is much better than the Brooks Racer ST5. The drop is lower, the shoe is lighter and there is more pop thanks to that amazing U4ic midsole. And despite being lighter, the shoe does feel as if it has more protection, which may just be due to the lower heel drop and more material under the forefoot. Every time I ran in the Mizuno Wave Sayonara I wanted to run really fast. These shoes don't do recovery runs. I mean.... they do, but they'll kick and scream a bit before giving in. Not literally. That would be freaky. I don't think I would run in a shoe that actually kicked and screamed at me. I have run very slow, tired and sore runs in them and they have done fine (I've only done a few of those though). Really the Sayonaras are meant to go fast. The sole is fairly firm and remains that way. Not racing flat bone crushing firm, but responsive/protective firm. I'm pretty happy with what Mizuno has done with the sole of the Wave Sayonara. It almost has full ground contact, which Mizuno is generally not good about. Like Asics, they like separating out the forefoot and heel, which I have problems with since I suspect that leads to a bend in the midfoot which could lead to some plantar fascia issues. I have no study to back that statement up, only personal observations of hundreds of customers and runners working in running retail and biomechanics knowledge as a DPT student. It's just a hypothesis at this point. Mizuno has done better with that (that little lateral midfoot section could use some work) in the Sayonara. The G3 sole pattern on the Sayonara is both very durable and grips the road very well. I have never had any slipping issues in this shoe (like other shoes.. cough pureproject shoes cough) and the sole provides an awesome base from which to push off from when running fast. The black rubber on the shoe in the heel and the lateral forefoot is super durable. Over the +200 miles I have on my pair, there is next to zero wear there. So expect (from an outsole durability standpoint) these shoes to last a long time. As the Sayonara is a replacement for the Precision and Elixir, Mizuno put some mild support elements in the medial heel to provide just a but more of a stable platform. It is still listed as a neutral shoe, but know that those who need some support will get it from this shoe. This comes both from the wave plate in the heel as well as a fairly firm and narrow heel fit. So again you can see why this would be a great choice for a long distance marathon/half marathon racing shoe for those who need just a bit more shoe. Although granted the Adidas Adios/Adios Boost only weighs a few tenths of an ounce lighter. So it's not that much more of a shoe. One of my few problems with the Sayonara is how stiff the actual heel is underfoot. 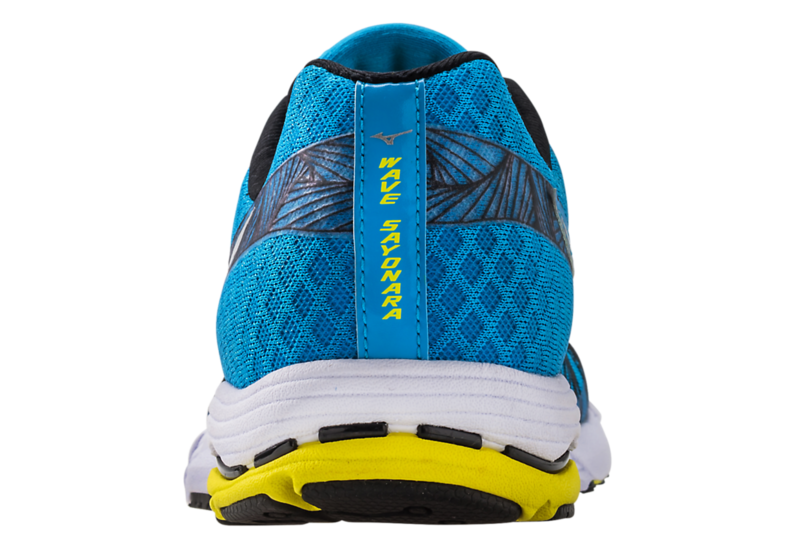 The forefoot is responsive and has some flexibility, but the heel has next to none. So if you are a heel striker or someone who hammers down on their heel when they are tired (me), this shoe may not be the best option for you. The lack of flexibility back there gives it a bit of a jarring sensation if you land really hard. If you are a mild heel striker, midfoot or forefoot striker, these will be fine for training. Heel strikers may want to save these for workouts or races. Other than the heel inflexibility issue (which prior to Mizuno's current line, ie the Inspire 10, Rider 16, Paradox, etc was pretty common for their trainers. Things have changed) I really like this shoe. 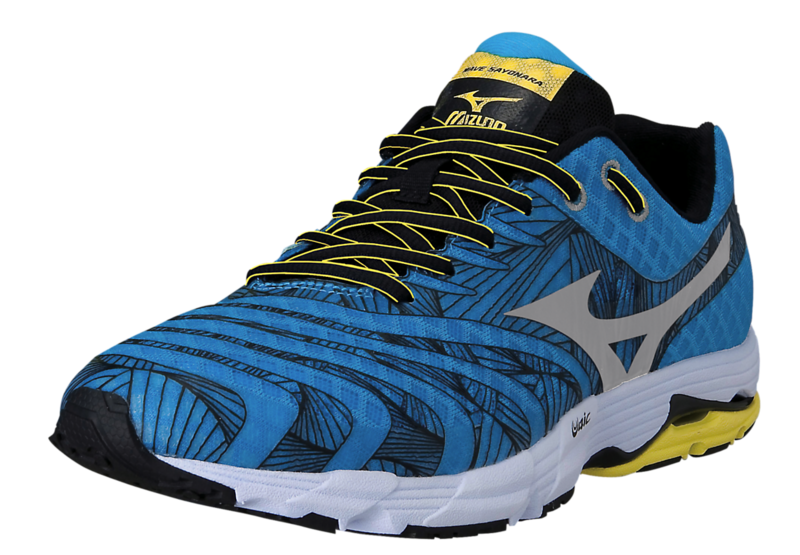 If you like a lightweight trainer with a wide forefoot, narrow midfoot/heel, that is very responsive, the Mizuno Wave Sayonara is your shoe. It's great for workouts, uptempo runs and even racing. That and it's a fairly durable shoe. If nothing else try them on and tell me what you think! 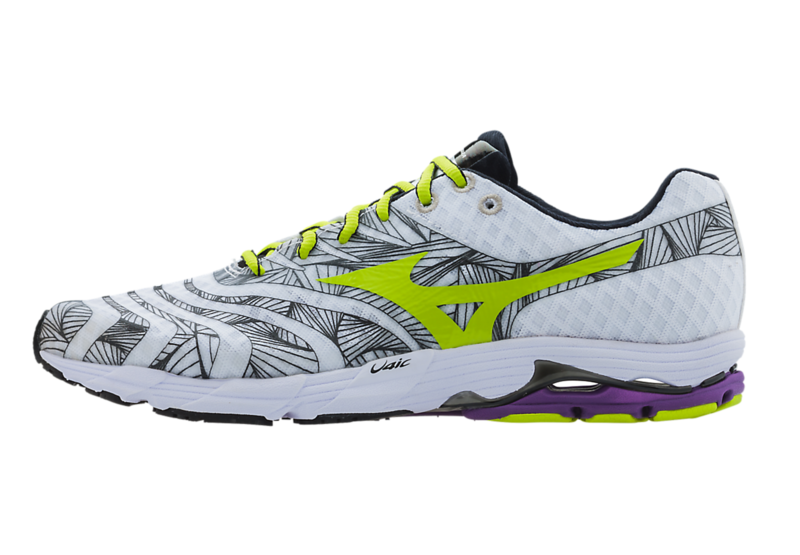 *Images obtained from the Mizuno Running website. Again, go down to your local running specialty retailer to check them out!